Stunning brows are just one appointment away. Microblading is known by a variety of names such as eyebrow embroidery, microstroking, feather brows and hair like strokes. 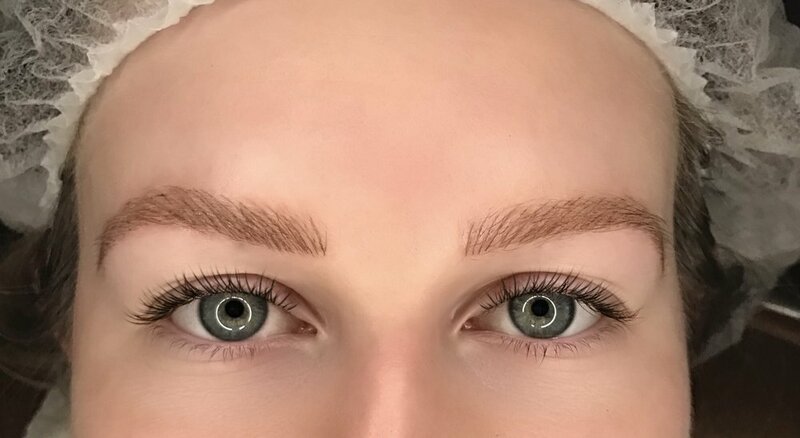 Microblading is a form of permanent makeup that provides a means to partially or fully camouflaging missing eyebrow hair with the appearance of simulated hair by using a micro handheld blade & fine deposits of cosmetic tattoo pigments. ECMA artist & founder Edin Carpenter is now offering microblading services. The cost is $600.00 for two sessions. The first session is 2.5 hours and includes a consultation, the 2nd session is 1.5 hrs and occurs 4-8 weeks post healing from the first session. A touch up or third appointment is $300. There is a 50% deposit collected to reserve your appointment as availability is extremely limited. We require a 14 day notice to adjust schedule. Deposit is non-refundable. Please email ECMA for more information & scheduling inquiries. Booking a touchup appointment is the client's responsibility and is subject to availability. Please email to book as soon as your first session peeling has subsided.